Question: I am writing a shell script in which I need to compare two version number strings (e.g., "1.2.30" and "1.3.0") to determine which version is higher or lower than the other. Is there a way to compare two version number strings in a shell script? When you are writing a shell script, there are cases where you need to compare two version numbers, and proceed differently depending on whether one version number is higher/lower than the other. For example, you want to check for the minimum version requirement (i.e., $version ≥ 1.3.0). Or you want to write a conditional statement where the condition is defined by a specific range of version numbers (e.g., 1.0.0 ≤ $version ≤ 2.3.1). If you want to compare two strings in version format (i.e., "X.Y.Z") in a shell script, one easy way is to use sort command. 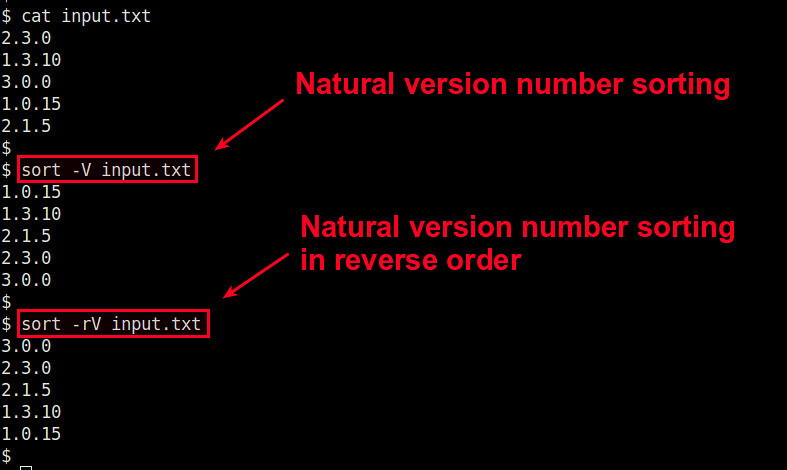 With "-V" option, the sort command can sort version numbers within text (in an increasing order by default). With "-rV" option, it can sort version numbers in a decreasing order. Now let's see how we can use the sort command to compare version numbers in a shell script. For version number string comparison, the following function definitions come in handy. Note that these functions use the sort command. These functions perform, respectively, "greater-than", "less than or equal to", "less than", and "greater than or equal to" operations against two specified version numbers. You will need to use bash shell due to function definitions. Below is an example bash script that compares two version numbers. echo "$VERSION is greater than $VERSION2"
echo "$VERSION is less than or equal to $VERSION2"
echo "$VERSION is less than $VERSION2"
echo "$VERSION is greater than or equal to $VERSION2"
It would probably worth also adding -b to make sure that some extra leading blanks don't confuse sort. When you want this done in PHP there is a function called version_compare — Compares two "PHP-standardized" version number strings. Thanks for the pointers. But GNU coreutils already come pre-installed on all Linux systems, so no need to install any extra software such as devtools or php-cli. rpmdevtools only works on RPM-based distros. And then I saw that -V does this type of sorting already. So the rewrite is only necessary if your version of sort (like mine) doesn't support -V.
What version of coreutils and which distro are you using? It does not treat, e.g., "0.9" and "0.9.0" as equivalent. The version_ge function says 0.9.0 is NOT greater than or equal to 0.9.